Newt Slithers to the Lead in S.C.
Today, Republicans in South Carolina go to the polls to vote for a GOP candidate to run for president in the fall. In a stunning reversal of fortunes, former front-runner Mitt Romney finds himself trailing former Speaker of the House Newt Gingrich, who is favored to win in the conservative-leaning state despite revelations from one of his former wives, Marianne, that Newt cheated on her in her own house and asked for an “open marriage” in which he didn’t have to hide his relationship with mistress (now current wife) Callista. Marianne suggested that Newt doesn’t take his marriage vows very seriously. 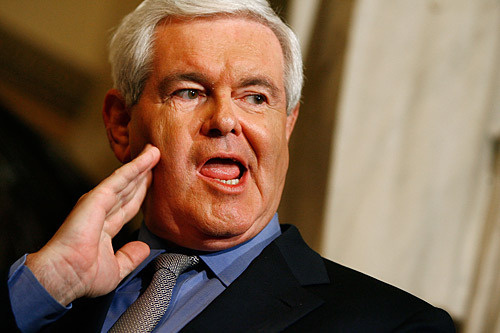 Since his own behavior is clearly indefensible, Newt did the only thing he could: He shot the messenger. Employing the GOP’s favorite trope, Newt blamed “the media” for bringing Marianne’s statements to light. At the beginning of Thursday night’s debate, he launched into a tirade at CNN moderator John King for daring to bring up Newt’s own marital history.